Our EasyRods '57 "Belaro" Kit fits all 10 years of 1993-2002 Chevrolet Camaros, Coupe, T-Top or Convertible, V6 or V8, Manual or Automatic Transmission. Unlike a real 1957 Chevy Bel Air, these vehicles have all the modern conveniences, including Fuel Injection, Overdrive, Airbags, Power Steering, Tilt Wheel, Stereo and Power Windows. The EasyRods 15-piece, high quality fiberglass "Belaro" Kit is pre- engineered to be assembled in hours – not years! 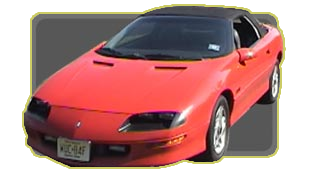 The front bumper is part of the front fender (it bolts to the stock 93-02 Camaro mounts), the hood is a direct replacement for the stock Camaro hood (it uses stock hinges, struts, latch & catch and all original bolts). The two door panels cover the curved Camaro doors. However, THE BEAUTY OF THE DESIGN, is that our quarter-panels snap into the original trunk gap under the roof, into the door jam and wheelwells. 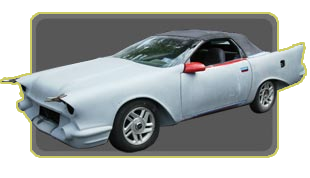 Then they are simply glued OVER the original Camaro quarter panels. Included in the panel are all the '57 Chevy details like 150 trim; LED tail lights; bumpers and light buckets for the Camaro brakes; and Directional & Backup light sockets. The '57 rear bumper cover goes over the stock Camaro bumper and cleans up the bulkhead under the Camaro tail lights. The Belaro trunk lid overlays the stock Camaro trunk. All of this can be completed in about 50 hours!!! 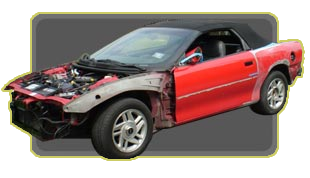 It takes 3-4 hours to remove the Camaro hood, bumper, fenders, taillights, rear bumper cover and gas cap door. Our fiberglass components bolt on, screw on and glue on in approximately 50 man hours. 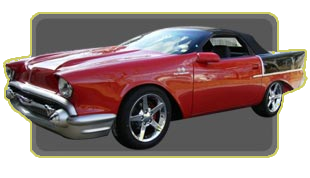 The EasyRods '57 Belaro kit is complete with everything needed to build it! We include a sandblock with sand paper, self tapping screws, fiberglass mat, 7 tubes of adhesive, headlight rings, buckets, pigtails, LED tail lights, directionals & backup lights, DVD, instructions and delivery! You supply the finish bodywork, then prime, paint and chrome to your taste. There are many different grill styles and small touches you can add to create your own completely unique vehicle! With an EasyRods Kit you will be driving a COOL & RADICAL EasyRod in Hours NOT Years!